In an effort to provide material which reached as many readers as possible, his work extended into translation and curation, while his authorship broadened across genres and mediums: both fiction and non-fiction, books, journalism, and political columns. Based on the strength of a 1954 detective novel (mouthwateringly titled Es Vessa Una Sang Fácil or “Blood Easily Spilling”), he was tapped by a company named Edicions 62 to run an imprint for detective fiction, where he published translated works by Chandler and Simenon alongside those of local authors and his own. Typescript of the Second Origin (1974) is one of his many works of science fiction, which are inevitably cast in shades of political allegory. This compact book was originally published by an imprint catering to what we would now call the YA market, and its overwhelming success — it remains the best-selling work of fiction in Catalan — was something of a sore spot for an author whose works were varied, and (at times) hugely ambitious. It was, perhaps, as if Frank Herbert had accidentally written The Hunger Games. When Spain transitioned to a parliamentary democracy after Franco’s death the following year, the restrictions against Catalan were lifted, and Typescript was subsequently enshrined as a work assigned to year after year of students educated in this language. 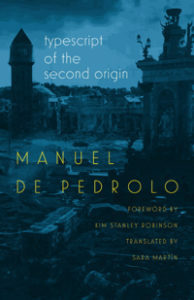 Owing to a variety of factors (both literary and political), Pedrolo was met with indifference by Catalonia’s academic community in the later part of the 20th century — though it appears a new generation is beginning to re-evaluate his work. In her introduction, the translator Sara Martín notes that this book, first encountered in school, always stuck with her. The plot concerns Alba, “an olive-skinned fourteen-year-old virgin” who saves the life of a nine-year-old black boy named Dídac, who was beaten up and thrown in a lake, unconscious. While they are underwater, a fleet of flying saucers instantaneously kills the Earth’s mammals and razes its cities with a vibration weapon. Resolute, Alba leads Dídac into the forest, and into shaping an egalitarian society from the rubble. The relationship between the two is explicitly matriarchal; she raises and educates the boy in expectation that they will eventually reseed the human race. The book’s formatting and tone take biblical cues: each chapter represents a year, and is divided into numbered sections, each a few paragraphs long. Later: they farm, fix cars and boats, drive and sail, scavenge items from the ruined cities, kill an alien, grow up, become lovers. Whatever — it’s fine. The book’s provenance is, frankly, more interesting than the book itself. The translation errs on the side of simplifying the original Catalan’s twisty, antiquated syntax, rendering it suitable for a younger readership, but slightly dull, linguistically. The final chapter is a metatextual epigraph which frames the preceding material from the perspective of an academic some 7,000 years in the future. For modern American readers, Typescript might serve interchangeably with Z For Zachariah, another allegorical teenage-girl-survives-the-apocalypse novel from the mid-70s which many of us (myself included) were assigned to read in school. Or one of the dozens of recent politically-inflected post-apocalyptic YA novels with female protagonists available in any-and-all flavors of ideology. Devin Smith is a musician and nonfiction writer in San Francisco. See his website for a full list of projects.